Coming up is a very important day for me – April 1st. Way more than pranks and goofiness (that’s every day in my world), it’s the day one man’s whole life changed from what had been and had been spent and salvaged and used of that to build life to that point – to another, very different climb for a changed man with an old van and a new plan. April 1st is the day I handed over the key to The Music Shop on W. Emerson St. in Melrose, MA – truly what became the first day of the rest of my life. It had been a confusing time for me of finding my way through my early and mid 20s, figuring out what I added up to that I could become and grow into, and learning to trust and follow that deep inside instinct saying “yeah, do that – go there” that others around me, hoping for the immediate results of one-step games, really didn’t understand. I knew if I did THIS, something would happen and I’d then ride THAT. While this was all going on, the little music shop became magic – the changes in some of the folks who got lessons there, the kids who I shared what I could of my late 20s coming-out-of-the-fog advice with… some of them who figured out I spent a lot of time there after hours would even prank call me and bring me food, bless them. It meant the world to me. Through starting a scene in Melrose – let me rephrase that – through providing a place where the components of the scene could come together, find each other, and grow together, forming bands and learning and being exposed to new music, there came a garden there that fed. The community, those who were a part of it in some way, those involved in THEIR ripples, all since a part of what it has been in more recent years, and lastly… me. It fed me, it seeded my dreams, customers gave me little trinkets and a few tools I still have and use, and I will never forget the acceptance the young people gave me. I did not get that in my first go-around in that city when I was their age; but I brought music, the most sacred thing to me, I carried that back there during the crossroads of my life and planted it like a flag. THIS is what’s happening, and it’s happening HERE and it’s happening NOW and it MEANS something. I brought that, put up a pirate flag as an open sign and sold all kinds of music stuff from albums to amps, CDs to guitars, strings to memorabilia. Most used and all priced to go and labeled with a sense of humor. And while I tried to serve everyone that came through the old wood door with the blues brother poster in the window as best I could whatever they needed, they helped me find my path. It was where I built my first guitar – and the first short scale bass design I came up with. And it was there just by doing this guitar building thing on the side as kind of a nifty thing to do and to express things in a new artistic way through form and craft, I stumbled onto – and into – the very trade I would a few years later gamble everything on. That this was my path onward. That this was my dharma and destiny. That this was the next chapter all of THAT had added up to and ITS tools could build. It all really started rolling there. 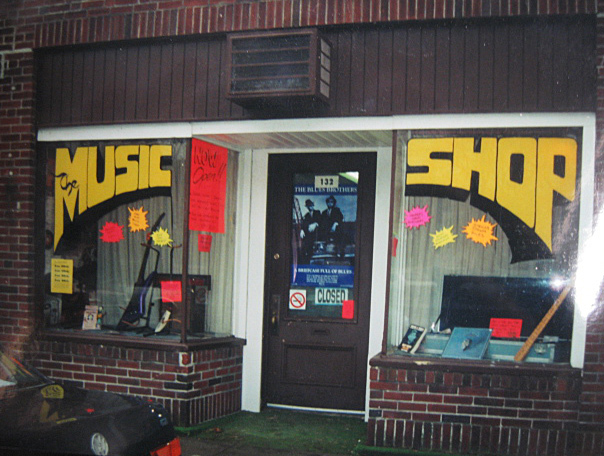 The music shop in Melrose was also the first thing that really worked in my adult life, and a big lesson in learning how to jump off of something like that to pursue your life to its next level. It got you what it got you – now to use those things as tools you leave it for the next base camp. And I did just that – waiting for me was a ’73 Ford box van named Blue Moon I had been having mechanically gone through at Lenny the mechanic’s like the guy with the boat in his backyard getting fixed up to someday sail off for adventure. Well my someday came that April 1st. One of many – and the key to the others – that came since. I had just executed a chess move. I’m no chess player, but it is won by strategy and several moves. It’s not a lottery. It’s not a light switch. It’s a series of decisions in layers that step up. At 50 I see life this way; in my 20s before that shop, I did not. Blue Moon, in all its freshly purple shag carpeted glory, would be my home for a bit, but that’s another chapter of another story. After what felt like hundreds of goodbyes and good lucks, some of which cut very deep, I drove away down the highway. When destiny calls, you go. April 1st, 2000. Big, big day. The people who own it now have no idea who I am and that’s fine. I don’t do things to get engraved memorial plaques. But I do leave a message on their machine for every single April 1st, usually a celebratory second Laphroiag in, wishing blessings on the little shop and its owners and all who it helps out. It sure helped me out. Sometimes when you feel lost and empty, aim for something big – you have nothing to lose and it might be an entire tool kit and education package for a new life. Listening To: Captain Beefheart and His Magic Band – Safe As Milk; Semisonic – Feeling Strangely Fine.